How to Survive Peer Review is a practical handbook designed to help anybody who wants to get their work published in a scientific journal, wants to apply for research funds or who has to undergo formal appraisals at work. It will also help people who have been asked to review articles, abstracts or grant applications. These activities are an essential part of scientific life, yet they virtually never get covered in professional training. It is often difficult even to get any helpful information about the processes from journals, meetings or funders. For the first time, this book brings together all you need to know, with authoritative advice from three authors who have researched peer review extensively and have considerable practical experience as researchers, editors and reviewers. 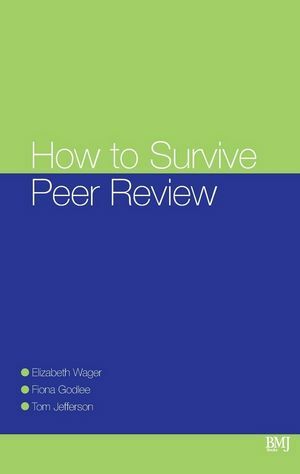 Elizabeth Wager is the author of How To Survive Peer Review, published by Wiley. Fiona Godlee is the author of How To Survive Peer Review, published by Wiley. Tom Jefferson is the author of How To Survive Peer Review, published by Wiley. How to be a reviewer. How to survive peer review. Written in an accessible and entertaining style, the book offers practical advice for healthcare professionals at all stages of their careers. It is the only book that covers the full spectrum of peer review, not only journals but also conferences, grant applications and professional peer review. It also covers informal peer review, an important aspect of writing and publishing that is usually missing from other texts.